Russ Hewitt released his latest CD, “Alma Vieja” in 2011. Replete with the rumba flamenco rhythms and lightening guitar runs that have become the trademarks of his distinctive style, “Alma Vieja” also includes a stellar line-up of backing musicians. 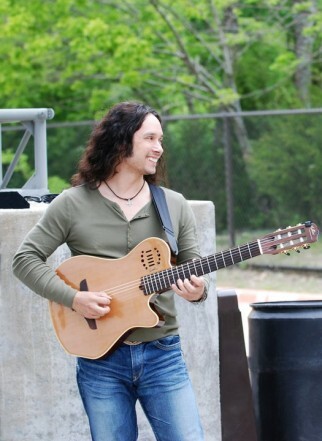 It was in late 2008 that guitar virtuoso Russ Hewitt released his debut CD ‘Bajo el Sol’. Typified by fierce Latin rhythms and infectious contemporary jazz grooves the album garnered the kind of critical acclaim to suggest this talented player was already on the road to musical stardom. With favorable opinion rapidly translating into prolific air-play, the recording enjoyed a ten week stay at 1 on the Music Choice satellite – cable television smooth jazz play-list and for the last 16 months has maintained a constant presence on the Smooth Jazz indie charts. The first track to be released to radio (the dazzlingly Latin flavored title cut) climbed into the top 20 and the two that followed enjoyed similar success. ‘Lydia’ peaked at 15 and stormed onto the Billboard’s Top 40 while ‘El Beso’ also made it onto that same Top 40 listing. In addition, ‘Bajo el Sol’ made the first cut for the 52nd Grammy Awards in the categories Best Pop Instrumental Performance, Best Pop Instrumental Album, Best Instrumental Composition, Best Instrumental Arrangement and Best Engineered Album (in the non-classical section). The tune ‘El Beso’ was included in thewww.smoothjazznow.com Top 75 Smooth Jazz Songs of 2009 and, most significantly, from a field of 15,000 applicants, Russ Hewitt gained an ‘Honorable Mention’ for the title song ‘Bajo el Sol’ in the Instrumental Music category at the 2009 International Songwriting Competition. Now Hewitt’s much awaited follow up is all set to hit the streets later this summer. His rumba flamenco rhythms and lightning guitar runs are sure to feature significantly and, much as with ‘Bajo el Sol’, Hewitt’s playing will be complemented by a stellar line up of backing musicians. Former Miami Sound Machine percussionist Raphael Padilla is again in the line-up as is drummer Walfredo Reyes Jr who, in his time, has played with both Santana and Ricky Martin. Bass player Bob Parr and exciting flamenco guitar prodigy Alfredo Caceres are also around to lend a hand but this time Hewitt has gone one better by adding some fantastic guest artists. Grammy award-winning violinist Charlie Bisharat, who has graced the stage with heavyweights such as The Rolling Stones, Yanni and Aerosmith, has already been confirmed and will be joined by contemporary jazz saxophonist Michael Lington. For Hewitt this latest project represents a significant milestone. He has followed his musical dream from an early age and made a conscience decision never to put material things ahead of his passion for music. Influenced by many techniques and always guided by a relentless pursuit of guitar excellence he has arrived at the enviable position in his life where he is able to play in a variety of styles, at a range of tempo’s, interact with great players and make a living from doing it.